Click above to download a 25 page extract. Iraq and Afghanistan are two seething cauldrons of hatred and death - lands of roadside bombs, rocket propelled grenades and savage ambushes. Day after day, our soldiers face implacable and ferocious enemy forces in the searing heat and choking dust. But the young men and women of our armed forces do not have the luxury of deciding where they fight, and in these faraway deserts and towns, a new breed of hero is being born. Life Guards Lance Corporal of Horse Andrew Radford ran 70 metres through a hail of machine gun fire and RPGs to rescue a terribly injured colleague. Royal Marine Sergeant Matt Tomlinson charged machine gun posts during a river ambush outside Fallujah, and saved the lives of the US Marines he was attached to. Parachute Regiment Lieutenant Hugo Farmer led his men in a desperate, three-hour fire-fight against the Taliban – in the same action for which Corporal Bryan Budd was awarded a posthumous Victoria Cross. 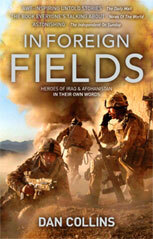 In Foreign Fields features 25 medal winners from Iraq and Afghanistan talking about the actions which led to their awards. Modestly, often reluctantly, they explain what it’s like at the very sharp end, in the heat of battle with death staring you in the face. Destined to become a modern classic of war reportage, In Foreign Fields will appeal to all who care about our armed forces.